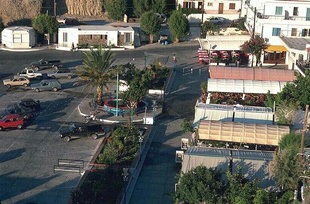 In the town behind the harbour there are many satisfactory restaurants and hotels. Agia Galini is a good place to stay overnight or for some days to explore the Amari Valley and the south side of Psiloritis, and to visit the archaeological areas of the Mesara Plain . 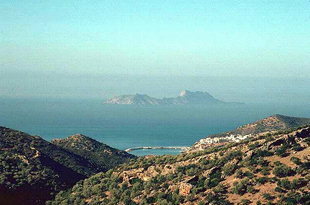 The village clings to the mountains above the harbour, and has panoramic views across the Libyan Sea. The bay of Mesara shelters the harbour and provides a mild year-round water temperature. 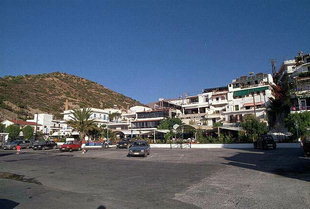 Opposite Agia Galini are seen the Paximadia islands, that can be visited by rented boats. Along the coast, marine caves are accessible only by boat. One such cave, the cave of Daedalus, is said to have been the workshop of the mythical craftsman. The beautiful beaches of Agios Georgios and Agios Pavlos are nearby and accessible by caique (boat). 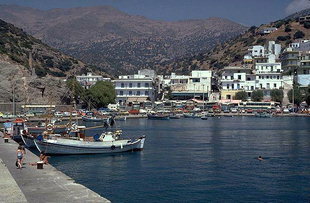 In addition, frequent sea excursions are available from Agia Galini to Matala, Preveli, Plakias, Frangokastello, and Hora Sfakion.